Two doctors in the Philippines wanted to reduce the amount of time patients spent waiting, while at the same time giving local government policy makers real-time data for decision making. They envisioned that the data could better allocate precious health resources by revealing outbreaks and projecting patient loads. Today, their system is doing just that and much more. In at least 50 health facilities in the Philippines, Community Health Tracking System (CHITS) has eliminated the scenario of rooting through paper files for patient treatment records. Ninety-five percent of surveyed patients using the system said it helped them follow doctor recommendations and become more involved in their care. Global use of e-health, but why? Far from being a one-off instance of innovators adopting information communication technology (ICT) to improve health care in low- and middle-income countries, the CHITS initiative is one of more than 300 such programs profiled by the Center for Health Market Innovations (CHMI). Health programs around the world use information technology as a core part of their model, with big clusters in South Asia and East Africa. Observing the widespread use of ICT, coupled with intense interest from the global health community—witness, the $50 million Saving Lives at Birth challenge, recent eHealth Africa conference, and annual mHealth Summit—a few of my colleagues set out to figure out why programs used technology. Putting aside the cool factor, how were professionals deploying technology to tackle key health challenges around the world? To answer this question, they analyzed more than 600 programs in over 100 countries—the contents of CHMI’s database at the time. Their findings, published in this month’s WHO Bulletin, highlight six key reasons health program managers adopt ICT as a core component of their model. Technology is used here to replace a traditional office visit. To chip away at the distance between doctors and patients, numerous programs are adopting tech systems like videoconferencing, automated helplines, and instant messaging. A prime example are the franchise network World Health Partners, in India, and the health advice program HealthLine, in Bangladesh, both of which use technology to serve patients in truly remote areas. Better communication between health workers and patients encourages patient compliance and can foster a better understanding about health issues. Patients can sign up with Jaroka Tele-healthcare in Pakistan to get reminder text messages to attend medical camps or bring their children in for vaccinations. Text to Change uses an interactive quiz administered over SMS to raise awareness of HIV/AIDS—producing a 40 percent increase in patients who came in for testing. These tools work to improve the clinical performance of health workers. D-Tree International develops and tests the use of phone-based clinical decision support software in Tanzania, Malawi, South Africa, and India to improve treatment of child illnesses, reproductive health, diabetes and tuberculosis. Health(e)Foundation develops web-based courses to teach health workers about HIV and other illnesses. These programs can complement the use of low cost diagnostics as recently described by Grant Tudor. As described above in the case of CHITS, many programs use technology to collect, organize and analyze data. 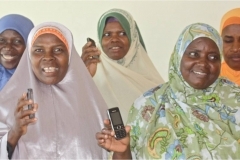 Nurses working for the Nairobi-based low-cost maternity chain Jacaranda Health register patient data on cell-phones, allowing data to be centralized and brought up again when a patient returns. These tools make it easier for patients to pay for care and for physicians to receive payments for care. Changamka Microhealth helps women save for care during pregnancy on smart cards and, soon, mobile phones. The program also provides women with access to packaged services at lower prices at certain hospitals. Along with streamlining health payments, another emerging use of technology is preventing fraud and abuse. This kind of technology helps managers verify critical information—medication, a patient’s identity, financial transactions, and the on-time deployment of human resources, for instance, a fingerprint scanner checking in workers at a facility. Operating in India and Cambodia, Operation ASHA uses biometrics technology to confirm a health worker visit to a patient’s home. [photo of OpAsha] Another example is the social enterprise mPedigree. People purchasing medications in Ghana, Nigeria, Kenya, and India can text message a unique code on the product packaging to check if the drug is fake or expired. The WHO Bulletin article also found that despite the heightened focus around the use of text messages for health, voice and software applications are more frequently used. In addition, programs launched before recent advances in information technology are not rapidly adopting new technologies when compared to newer programs with technology built in from the start. The study also finds that about half of programs using e-health received their primary funding from donors. This heavy reliance on donor funding could jeopardize their long-term success. As a starting point toward developing more government investments in e-health, Julian Schweitzer and Christina Synowiec—coauthors on the Bulletin piece—published an additional article this month in The Journal of Health Medicine outlining key economic and financial questions that need to be answered. Questions focus on the costs of e-health infrastructure, regulatory structures providing incentives at different levels of the health delivery system to encourage investment in and use of e-health, and ways to measure the outcomes of e-health implementation—like return on investment, of critical interest to health policy makers with limited resources. With better information on how and why ICT is being used to improve health care in low- and middle-income countries, the next step is isolating what actually works. Only a handful of the programs surveyed for the Bulletin article reported on impact statements in any category. Finally, working with policy makers to ask the tough questions about e-health’s return on investment, then actually scaling up these rather small projects, would be a significant step toward building an integrated, evolving health system that will stand the test of time.